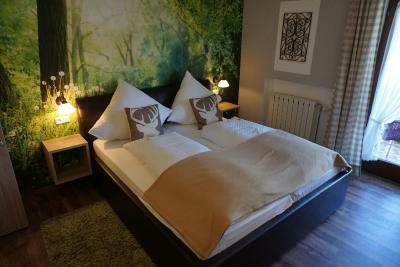 Lock in a great price for Zur neuen Post Landhotel – rated 9.4 by recent guests! The owner of the hotel is very very nice, we had an upgrade of the room because we are the last one to arrive. My husband was very happy to find the fitness room and sauna; there was a cake baked by the owner and offered to the guest for free, the dinner is very tasty and not expensive, generally speaking, it is a very nice hotel to stay. We booked a long weekend stay, with breakfast, at Landgasthof Zur Neuen Post. Ms Wurm welcomed us warmly, showing us around the hotel, and giving us information about the area. The room was clean, well-decorated, with a balcony and a great view. Perfect! There were common areas for coffee/tea, reading and board games, so you could meet other guests if you wanted to. There was an outdoor pool and a sauna (free entry on Fridays) and a massage salon (booking required). This is a really lovely place, off the beaten track. For those who would like to explore the surrounds, e-bikes are available at Zur neuen Post Landhotel for an extra 10 euros per day. We cycled about 25 kms to visit Nationalparkzentrum Lusen, with its educational and interactive tree-top walk and enormous viewing tower about 44 metres high. We also visited the large animal park to see animals such as elk, wildcats, wolves, owls, brown bears, and many others. Alles war sehr gut. Danke für den schönen Aufenthalt. 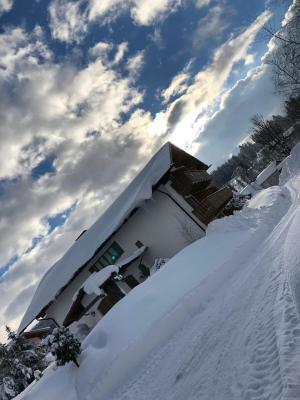 Wir waren zum Skifahren im Bayrischen Wald und waren sehr froh, uns für das Landhotel zur neuen Post entschieden zu haben! Wir würden sehr freundlich empfangen, auf besondere Wünsche beim Essen wurde stets eingegangen. Die Zimmer sind sehr sauber. Die Lage sehr gut! Wir waren rundum zufrieden und werden ab jetzt jedes Jahr vorbeikommen! 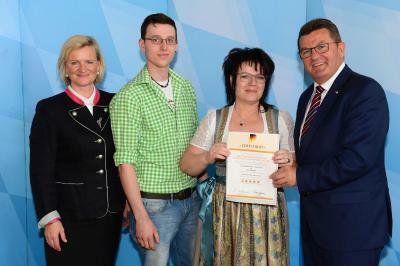 Tolle Lage, freundliche Wirtsleute und die Zimmer sauber und nett eingerichtet. Frühstücksbuffet reichhaltig mit allem was man so will. Abendessen lecker aus regionalen Produkten. De vriendelijke gastvrouw en het lekkere eten. Mooie kamers en rustige regio. Mogelijkheden om te relaxen. Prachtig berglandschap. Sehr freundliche Besitzerin, super Essen und ein tolles Preis-Leistung-Verhältnis. Sehr schönes Landhotel mit sehr netten Gastgebern. Nette Sauna im Außenbereich. Tolles Essen. Uns hat es sehr gut gefallen. 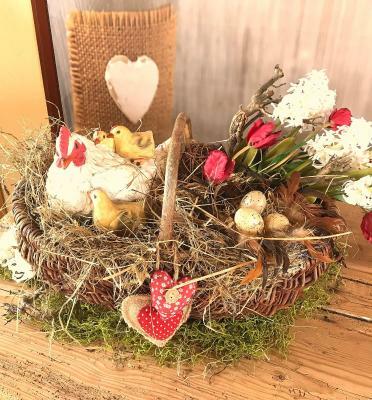 Ruhig und wunderschön gelegenes familiengeführtes Hotel, das keine Wünsche offen lässt. Familienskigebiet in der Nähe. Sehr saubere Zimmer mit bequemen Betten. 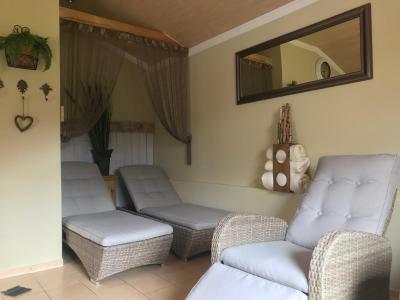 Schöner Wellnessbereich mit Dampfsauna, Finnischer Sauna, Biosauna, Ruheraum und Pool (in den Sommermonaten). Tolles Frühstücksbuffet und spitzenmäßige regionale Küche am Abend. Hier wird selbst gekocht und alles schmeckt einfach wunderbar. Toll ist, dass die Kinder ihr Essen immer zuerst bekommen. Man fühlt sich, auch wenn es abgedroschen klingt, wie bei Freunden zu Besuch und gar nicht wie im Hotel. Sehr nette Wirtsleute. 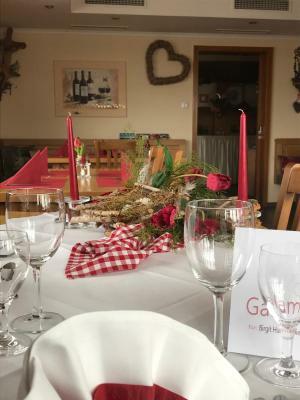 Ein tolles Erlebnis war auch die Fackelwanderung mit abschließendem Lagerfeuer und Jagertee in der urigen Almhütte, die auch zum Hotel gehört. Wir haben sofort wieder den nächsten Winterurlaub gebucht. Familienwinterurlaub wie aus dem Bilderbuch. Sehr, sehr empfehlenswert! Es hat unsere Erwartungen mehr als übertroffen, Frühstück super lecker, Personal sehr zuvorkommend. Küche ausgezeichnet.Wir kommen auf jeden Fall gerne wieder. Zur neuen Post Landhotel in Herzogsreut offers accommodations with ski-to-door access. Among the various facilities of this property are a fitness center and a garden. 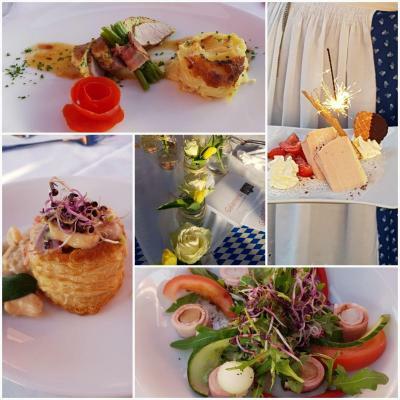 The restaurant serves German,Austrian and vegetarian dishes. All guest rooms come with a balcony or terrace with stunning view. 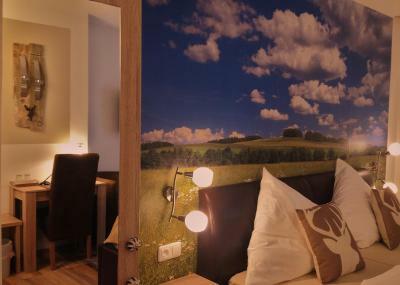 With a private bathroom equipped with a shower, rooms at Zur neuen Post Landhotel also provide guests with free WiFi. Mini-bar provides payable refreshements. Guests can also find tea and coffee facilities with free tea and coffee. The units will provide guests with a microwave. The accommodations offers a terrace. 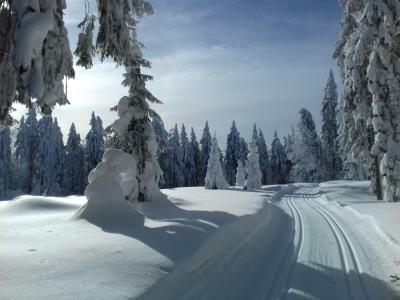 Guests can enjoy a range of activities in the surroundings, including skiing, cycling and hiking. Passau is 31 mi from Zur neuen Post Landhotel. CZ-Krumau is 43 mi away. This property also has one of the top-rated locations in Herzogsreut! Guests are happier about it compared to other properties in the area. This property is also rated for the best value in Herzogsreut! Guests are getting more for their money when compared to other properties in this city. When would you like to stay at Zur neuen Post Landhotel? This suite offers a wonderful view of the mountains and it features a flat-screen TV, stereo system, a mini-bar, tea and coffee making facilities (free coffee and tea), a telephone (free landline calls), mini-bar (payable drinks) and a bathroom with a hairdryer and bathrobes. Pets are not allowed in this room. This family room features two separate rooms, a living area with a sofa-bed, a sleeping area with a double bed. There is a bathroom with shower and separate toilet. It also comes with a balcony, tea and coffee making facilities, a refrigerator. Breakfast buffet and room service is included. WiFi is available. 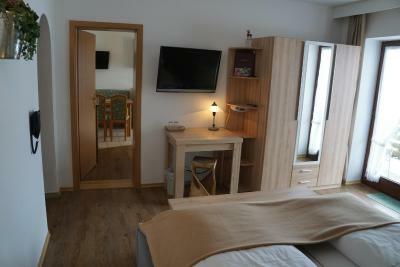 This single room features a seating area, a flat-screen TV, a radio, hairdryer, a refrigerator with payable refreshments, a safe and a telephone (free landline calls). The balcony is furnished with chairs and offers beautiful view. WiFi is available. This room features a seating area, a flat-screen TV, a radio, hairdryer, a refrigerator with payable refreshments, a safe and a telephone (free landline calls). The balcony is furnished with chairs and offers beautiful view. WiFi is available. This double room features two separate rooms, a living area with a sofa-bed, a sleeping area with a double bed. There is a bathroom with shower and separate toilet. It also comes with a balcony, tea and coffee making facilities, a refrigerator. Breakfast buffet and room service is included. WiFi is available. House Rules Zur neuen Post Landhotel takes special requests – add in the next step! Slow reception due to lack of dedicated staff for lodging; busy with restaurant. Inadequate WiFi, super slow, inadequate handling. Restaurant 80ies style. No proper curtains to darken the room against morning sunlight. Rather nice 3stars lodging in the countryside.